If Google+ reviews are so important, how come it’s so difficult to leave one on a mobile device? I’m not one of those who think Google is inherently evil, and that everything they do is a devious attempt to trick us into spending more on AdWords. OK, some of what they do is…but they’re a for-profit company, and need to do their best to make a buck for their shareholders…and that’s OK. The problem with having a virtual monopoly on any given space is that there’s no real incentive to be better than the competition. If you release a version of your software and it’s got problems, the customers won’t leave you in droves because–well, you’re really the only game in town. So innovation tends to be driven by the desire to produce something new and cool, rather than making the basic product work. Let’s take a look at Google Maps search, for example. I woke up this morning in sunny Manzanita, Oregon. Hungry…where to have breakfast? I do a search for “breakfast restaurants” on my iPhone, and get a nice selection of restaurants in Google’s little carousel. For Newport. That’s where I was yesterday. 2 hours away. So I scroll way down to the bottom of the page, and find a little link that says “use precise location”. OK, I click that. It finds me in Manzanita, all right. But doesn’t change the search results. I have to search AGAIN…ok, now I’ve got a list of restaurants near me. My son Ben and I toddle off down the road and have a marvelous breakfast (pan-fried razor clams, eggs, toast…and great coffee!) 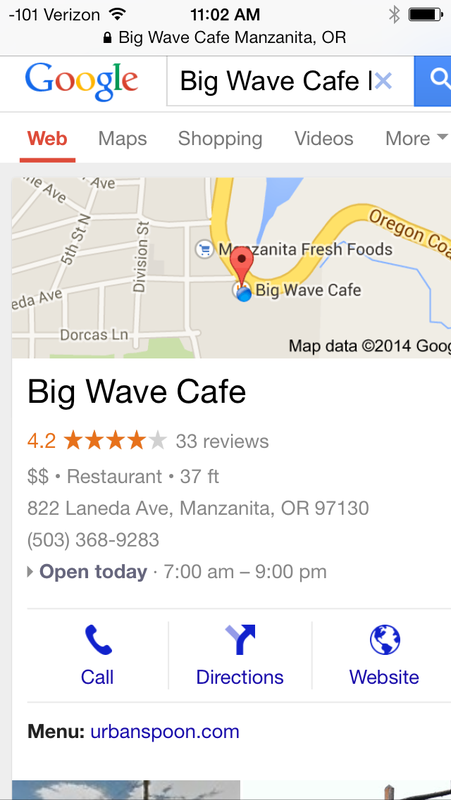 at The Big Wave, and I want to write a glowing review of this lovely little cafe, so I search for it on my iPhone, find the Google+ page for it, see all the existing reviews. But there’s no link anywhere for me to review it (and yes, I’m logged in to Google). This is all a pretty basic, ordinary, common use case for Google local search. Probably one of the most common use cases, in fact. And yet there are FOUR fairly important usability bugs in that process. I’m IN the search business, and have a very technical software background. Google, if I’m struggling to figure your interface out, it’s not me, it’s YOU. So Google, STOP messing with cutesy little changes to the interface. No more just building what you think is clever and cool, UNLESS you do proper usability testing with this, and get the basic, common use cases to actually work. And yes, I realize that you might not have the best pool of people in-house to test Maps stuff, when some of your people never leave your campus :-). The thing that baffles me is you still can’t just add a location to your Google Contacts. Talk about basic usability. Even if there were no frustrations with the new features Google implements, they seem to be forgetting that user experience is not just the features in the app right now, but the way that features are rolled out and updated over time.